What: As previously noted in my review of Bach Brewing’s All Day Extra Session Ale, a mate recently gave me a Bach Brewing gift pack consisting of four of the Auckland craft brewery’s finest beers for my 31st birthday (best birthday present ever!). On review here is the second 500ml bottle out of the box – the Witsunday Blonde IPA, which I enjoyed while watching the New Zealand Black Caps absolutely trounce Sri Lanka in a one-day cricket match on Boxing Day (we won by seven wickets with 174 balls remaining). Happy days. Blurb on the bottle: At the heart of Bach Brewing is our passion for craft beer and our love for the Kiwi Bach, a symbol of home-grown escape, simple relaxation and freedom. Witsunday Blonde IPA is a thirst quenching hopped-up Witbier. A cloudy fusion of wheat and pilsner malts, citrus hop aromas, and esters of Belgian yeast. Tastes like: A crazy hoppy witbier, rather than an IPA with wheat in it – if that makes any sense to you at all. I guess what I’m saying is, from the moment I poured the Witsunday Blonde IPA into my glass and marvelled at its lovely straw colouring – which seemingly glowed in the summer sunshine (see pic, above) – I knew this was going to have more characteristics in common with a Belgian-style wheat beer than an English-style India Pale Ale. The body and carbonation is like that of a wheat beer – perfect for summer drinking – but the strong citric aroma is definitely like that of a much hoppier style of beer, which keeps it interesting. It’s another beer with a fairly dry finish, but the taste of the hops lingers long afterwards. Is it the best beer ever? I think it might be one of the best wheat beers I’ve ever had. The advent of the Kiwi-grown hops makes for one hell of an atypically tasty Belgian white, meaning this beer is one to savour and yet it’s also easy to drink on a hot summer’s day. 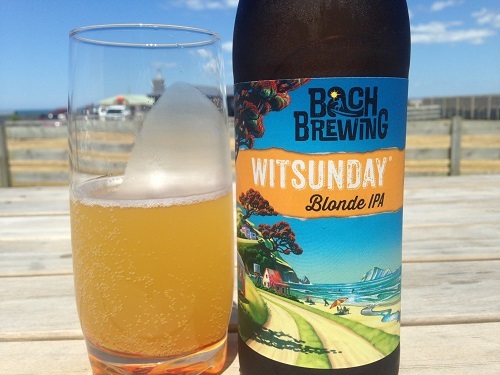 I’ve had nothing like Bach Brewing’s Witsunday Blonde IPA before, and now I’m wondering why we don’t see more white IPAs in New Zealand? It was a refreshing change of pace and I’d be keen to drink more of this style of beer in the future.